Strike Legion: Planetary Operations takes your tabletop command abilities to a higher level! Command full regiments and divisions, engage and defeat the enemy -and still be home in time for supper! Planetary Operations scales combat at 1 unit = 1 battalion, with attached units (scout, artillery, combat engineers, and other), air support, naval and tunnel movement/combat, complete construction rules, six complete forces, fifteen scenarios, many options for basic, advanced, and optional rules, and no less than three different styles of campaign games. Emphasis is placed on command decisions and the quality of your troops, not just on who has the latest, greatest hardware in their inventories. 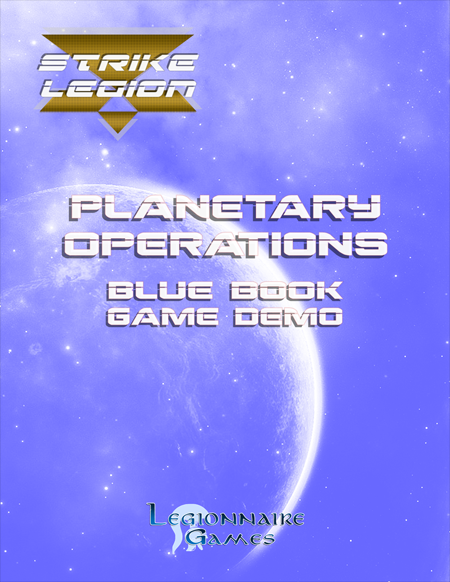 The free ‘Blue Book' version of Strike Legion: Planetary Operations contains the complete basic rules section from the Planetary Operations rulebook, along with all the other components you need to begin playing large-scale combat engagements (except miniatures and table space, of course).